It’s a sunny day in Annapolis, Maryland, a historic seaport often visited by founding fathers George Washington and Thomas Jefferson. CRAIG: “We are a national historic landmark city with approximately a hundred and twenty buildings still extant from the colonial period of our development…”That’s Lisa Craig, Chief of Historic Preservation with the City of Annapolis — which she says, even on a good day, can flood during high tide. It’s called nuisance flooding. And with climate change and rising sea levels, it’s happening more often. Add the threats of hurricanes and storm surges, and it’s a recipe for disaster. To make Annapolis more resilient, city officials are updating infrastructure and building codes and trying to safeguard the classic buildings immediately. For example, the historic market house is now surrounded by an inflatable life preserver that helps keep rising floodwaters at bay. Other strategies include moving furnaces, water heaters and breaker boxes to higher floors; raising electrical outlets; and installing special water-tight doors and windows. These efforts are intended to better protect the area from storm surges and ensure that nuisance flooding remains just that — a nuisance. Reporting credits: Lisa Palmer and ChavoBart Digital Media. 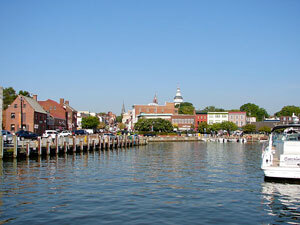 Photo: Annapolis harbor (Source: Wikipedia).